EXCELLENT: Corners may be a bit blunt or rounded. Almost undetectable crease or bend that does not detract from overall appearance of the picture side. GOOD: Corners may be noticeably blunt or rounded with noticeably slight bends or creases. 3 Piece Postcard Set Early 1900’s Stork Birth Announcement Babies Condition is Used writing and postmarks . Shipped with USPS First Class Package. 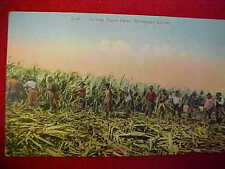 Cutting Sugar Cane, Hawaiian Islands. 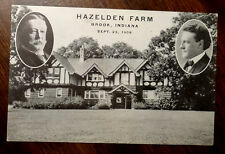 PRESIDENT TAFT'S 1st CAMPAIGN RALLY, HAZELDEN FARM, BROOK, INDIANA, SEPTEMBER 23, 1908. Age wear also as shown. The fort was razed after the First World War and its rights of way used by housing projects, sports facilities in the city of Saint-Denis and the RATP bus center in Saint-Denis. I do my best to accuratly describe each item. Very good condition. Checks are accepted only in France. Both in nice condition- no stains, tears or repairs. See my pics. The corners show slight wear. The back has slightly yellowed. 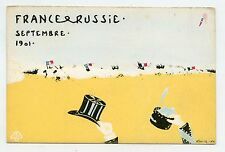 Postmarked January 22, 1909 France. Highly embossed. Gorgeous Art Nouveau vase with woman reaching up. The gold, lavender and bronze colors are spectacular! Enlarge to see the detail! Post card itself was made in Germany. Good condition. Comes in protective sleeve. Very nice CPA GOOD year animated. early twentieth. We're in a different era. A lovely card written inside the little pink envelope decorated with thoughts that you can probably read. Simple letter under protection for export. Near Mint (NM) : Like mint, but very very light aging or very slight discoloration from being in an album for many years. Not as fresh looking. Average (AV): Creases and bends more pronounced. May have writing in margins on picture side. I don't know when (or if!). this event actually took place. It is in good to very good condition. There are no tears but the corners are slightly worn. Size: about 6" x 4". Condition: minor wear from handling, no markings. Card has a horseshoe and multicolored roses. Top left has a crease and bottom right the top glass has a crack. .  . A Bit Of History (not on card): The man who was hired to portray Don Gaspar was Nicolas Covarrubias. Card Number: P9 (lower left corner on reverse). Very Good (VG): Corners may be just a bit blunt or rounded. Unused card in excellent condition. March 8, 1900. In Paris, an explosion produced by the bursting of boilers sets off a fire at the Comédie-Française, causing the death of actress Jane Henriot. 8 March 1900. This is a complete RARE set, in a perferct condition. all cards are there. CARDS ARE UNUSED. of each year. The fort was razed after the First World War and its rights of way used by housing projects, sports facilities in the city of Saint-Denis and the RATP bus center in Saint-Denis. ROUNDED CORNERS. TRACES CORNERS.PREVIOUS ALBUM. 1913 Knights Templar Meeting postcard.. Denver, Colorado location.. picture of Electric Sunset and Mount of Holycross, 32nd Triennial Concave..Postcard hasn't been used.. Very good condition. Overall we consider this to be a great item! The image is titled : " Cap. V. Edwards - From San Diego, Cal. to New York, N.Y.". A smoker threw a match that had fallen into a pocket where the gas accumulated long ago. ROUNDED CORNERS.